An elegant look back to the1960s, our Tank Rack is formed from polished stainless steel then Black Chrome treated for a lasting finish. Attached with high tech silicone suction pads. Originally Inspired by Peter Jenks founder of Jenks Bolts. 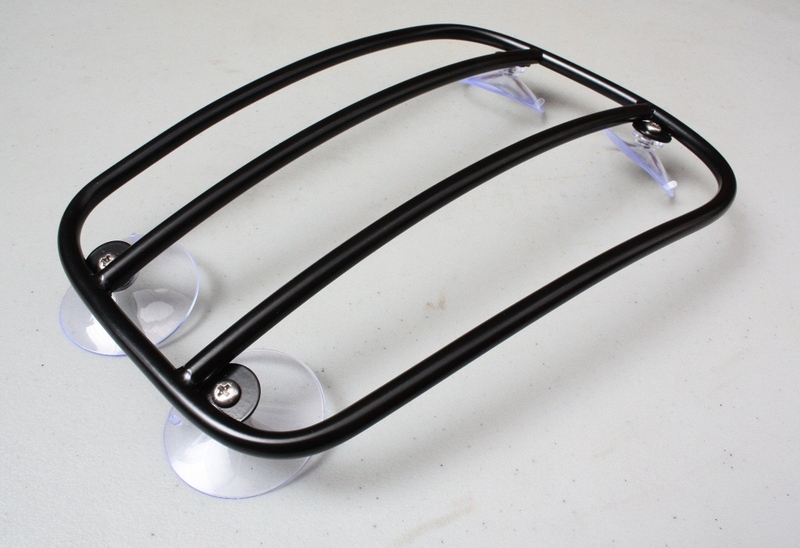 The tank rack is a 'Pseudo rack' originally created to mimic the bolt on tank racks fitted to sixties Triumphs. Of course you cannot screw it to the new Triumph tanks. So the designer has used vacuum suction cups to attach it for a purely cosmetic appearance. If you use the rack with the retro tank bag, it will require additional external strapping to prevent movement whilst riding. Fits the Bonneville, T100 , Scrambler, America and Speedmaster and the Thunderbird and "Legend" series. Will Not Fit Thruxton Models. The rack also looks good on classic British bikes, such as the BSA A10 and of course Triumph Meriden Bonnevilles.